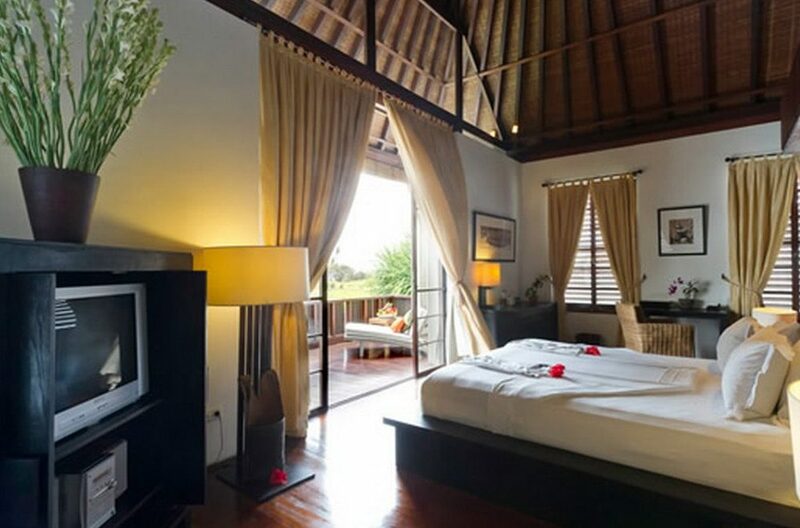 Villa Nataraja is steps from the beach, right on the southeast Bali coast. Ocean views, soothing sounds of the surf, a glistening pool framed by a lush green garden, and modern luxury awaits you at this superb property. It’s a beautiful relaxation destination that will leave you spellbound by its sumptuous comfort and breathtaking locale. At Villa Nataraja, you will be seduced by the twelve-meter outdoor pool with dual hot tubs; the ambrosial, intimate gardens with poolside pagodas for massage and recreation; and the three deluxe bedrooms for you and your guests. Ample lounge areas and easy beach access increase the all-around vibe of relaxation. 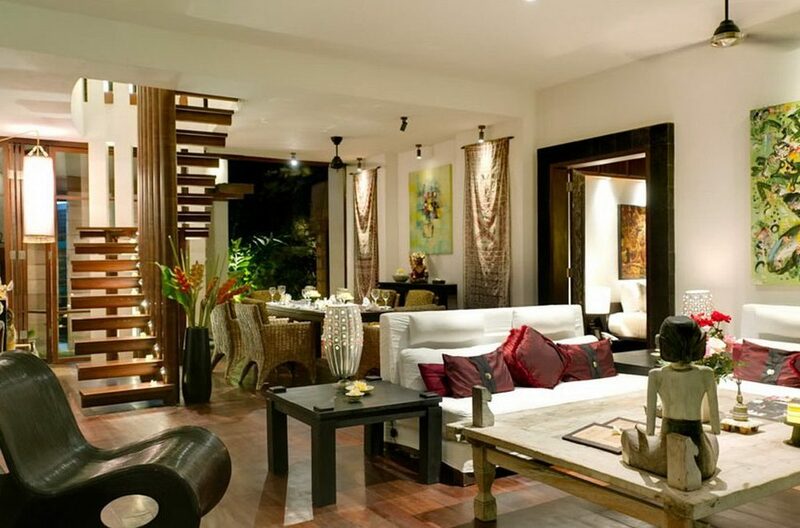 Villa Nataraja is perfect for the whole family or small groups. 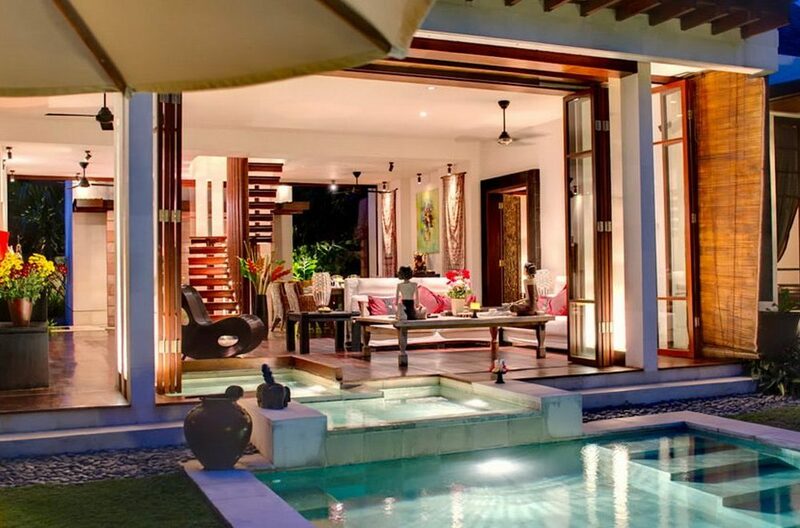 Two adjoining villa properties can be rented to create a large group vacation, retreat, or wedding destination. Shining black sand beaches with stunning scenery are characteristic of the Pabean Beach location, where the quietude and unspoiled nature lend itself to meditative oceanside strolling, or surfing on unpopulated breaks. All your holiday desires will be handled with Balinese hospitality by our cheerful staff. Villa Nataraja’s butlers, chef, and spa service pros are just waiting to spoil you and your guests. 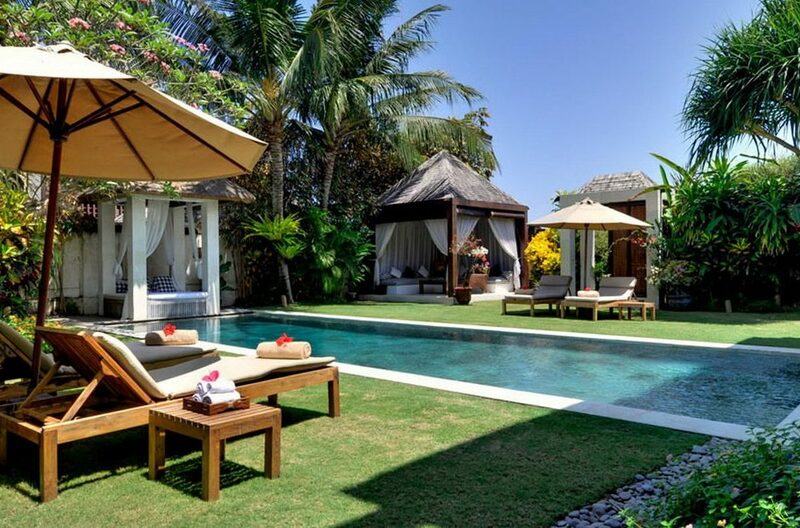 Luxury on the edge of decadence and dramatic refreshment combine to create a unique property at Villa Nataraja. You’ll have a deep slumber fit for a king or queen in the second floor master suite, royally furnished with comfy king size bed and dark wood, streamlined frame. The guest bedrooms are identically appointed, and can be accessed on either side of downstairs living area via wooden doors filled with carved artwork. 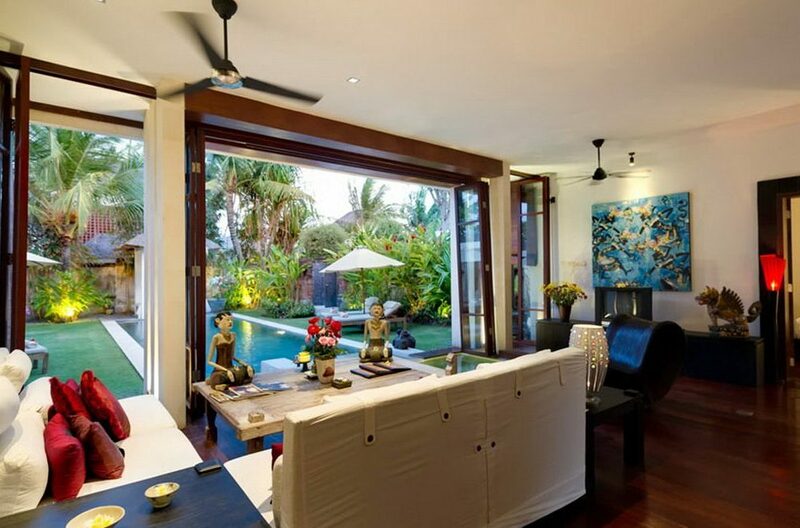 Sea breezes and garden views can be enjoyed through the large glass doors, or just chill out in air-conditioned comfort. The master bedroom doors open to a big balcony, where you can sit in the shade while sipping a coffee and admire the pool, gardens, and ocean. Downstairs, the guest bedroom doors open to the gardens, making it easy to do a few morning laps in the pool. All bedrooms are fully furnished with everything you need to relax or even sneak in a little work on your holiday. Flat screen TV’s with satellite channels or desks with comfortable chairs are surrounded by stylish decor that captures a modern elegance merged with an homage to ancient Balinese ways. Exquisitely designed ensuite bathrooms are hosted in each of the bedrooms. 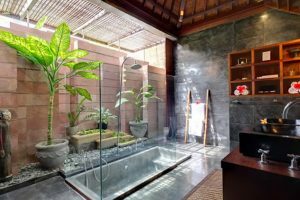 The master bath uses screens and a beam walkway to divide the area beneath its wood and bamboo lined roof into two sections, where an enticing soaking tub is the main attraction. Live tropical plants bask in the semi-open air environment of the guest bedroom baths, where black concrete and wood set off tubs and rainfall showers with gusto. All the necessities are thoughtfully included to keep you fresh and clean as a whistle. A spacious fan-cooled living area on the first floor brings the the outside indoors. Jacuzzi tubs and pool access are so convenient, you could get off the couch and right into the pool if you dare – so be sure to dress appropriately. Comfy couches surround a flat screen TV with satellite channels, with plenty of room for the whole gang to Netflix and chill, or maybe just stretch out and enjoy a best selling novel. The fully stocked, modern kitchen, and formal six-person table with cushioned chairs, are ready for you to try your hand cooking and eating delectable local recipes. Better yet, let the villa’s private chef do the cooking and serving, and you just sit back and eat until your belly’s full – it’s your vacation, after all. 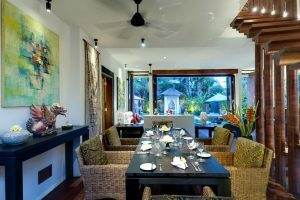 Everything’s on the menu at villa Natasha, including Western and Japanese dishes – all you have to do is ask. The iridescent pool waters beckon you for a refreshing cool off, perhaps followed by a thirst quenching coconut while reclining in a nearby lounge chair. 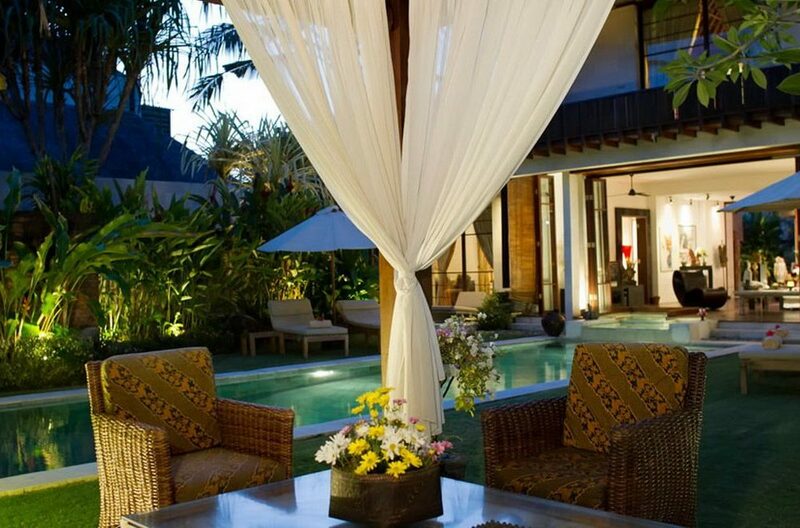 Order a Balinese massage and take in the sensations in your own private poolside massage pavilion. Evening drinks or all-day lounging in the garden’s large relaxation gazebo, furnished in comfortable couches, is just the thing to do on holiday. 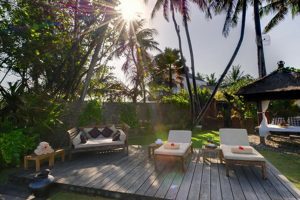 Take a wander down the walled pathway to the black sand beach for ocean exploration, or just appreciate the sunset from the shared timber deck and thatched-roof bale. A late night soak in the jacuzzis is how to finish the day right . Top of the line service, delivered with a smile – that’s the Villa Nataraja policy. Every member of the staff – from your butler to the chef to the masseuse – is here to share with you the very best example of Balinese hospitality. Housekeeping, security, and pool/garden service are all included with your rental. 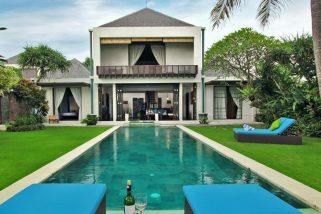 The butler will take care of your day to day needs, and the villa manager will cheerfully handle all your big requests. It’s a 5-star experience from top to bottom, because you deserve the best. 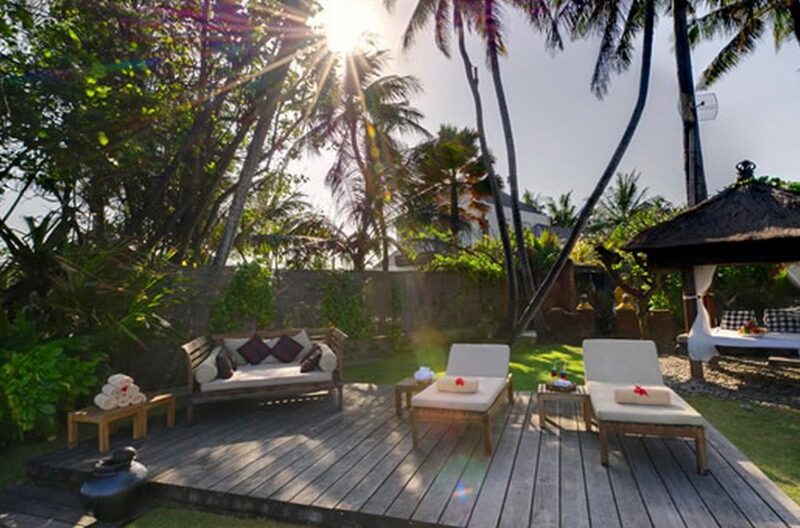 Black sand, spellbinding views, and untouched surf breaks – all part of the Pabean Beach experience you will find steps away from your door at Villa Nataraja. From Bali’s southeast coast you’ll experience gorgeous sunrises and beaches made for hours of quiet combing. Islands and volcanoes tease even more exotic locales in the distance. A short walk into the local villages you’ll find the beauty of daily Balinese life and culture, and lots of tasty local warungs where you can grab a meal and dive into the local scene. Internationally renowned dining, shopping, nightlife, and beaches can be found with within driving distance. 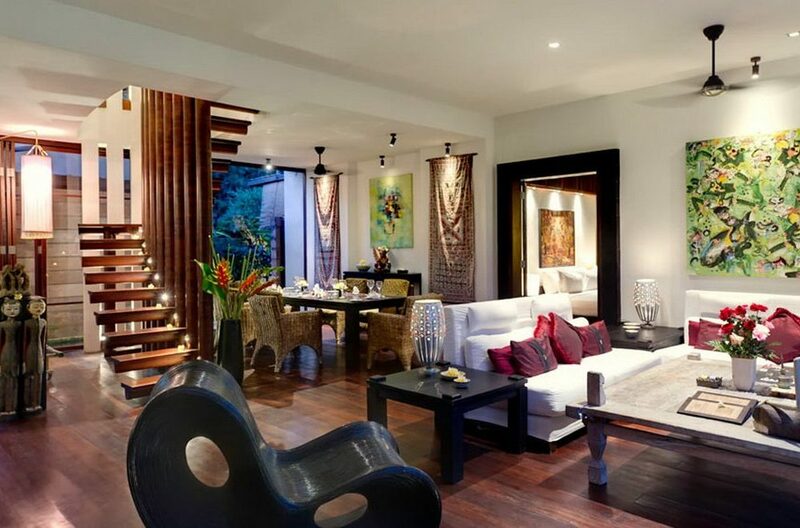 Glitzy Seminyak and funky Canggu are close enough to be convenient, but far enough to keep things quiet. Ubud, the cultural heart of Bali, is also a reasonable drive away – perfect for a day trip to take a cooking class, make batik, or do some yoga. Your villa manager will happily help you make all the necessary arrangements to explore the Island of the Gods. Villa Nataraja is the ideal location from which to have the Bali holiday vacation that everlasting memories are made from. 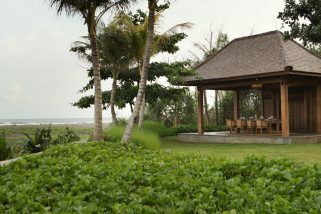 Pabean Beach – Ketewel, offers an absolute beach front location for Villa Samudra. With views to Mount Agung and the Lombok Straits, this three bedroom villa also provides rice field views, built over three levels, offering a luxurious tropical holiday experience. 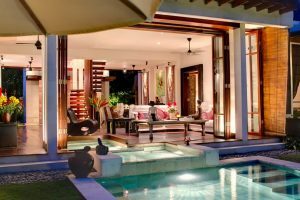 Villa Jeeva Saba is a one hectare beach front property situated in the sleepy village of Saba and on the front doorstep of the Indian Ocean. 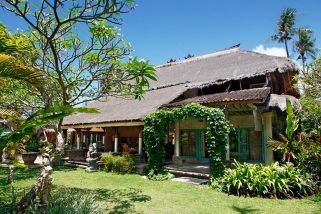 This villa is bountifull in rustic charm with an array of Indonesian antique furnishings and decorations whilst providing all the modern ammenities for a comfortable holiday experience.